Virginia football capped off an impressive June recruiting performance with a commitment from class of 2019 offensive line prospect Zachary Teter, who hails from Lake Gibson High School in Lakeland, Florida. UVA received pledges from 10 rising senior recruits last month, boosting its 2019 Class commitment total to 17. Teter, who measures in at 6’5”, 295 pounds, is Virginia’s third offensive line commit in the class. He is also Virginia’s fifth 2019 Class pledge out of the state of Florida, which has suddenly become a reliable recruiting territory for the Cavaliers under head coach Bronco Mendenhall. After 11 seasons as BYU’s head coach, Mendenhall accepted the job as University of Virginia head football coach in December of 2015. Most of his BYU coaching staff came with him. With the new Cavalier coaching staff having just two coaches (Marques Hagans and Ruffin McNeill) with significant East coast connections, it was fair to wonder just how successful Mendenhall would be in recruiting East coast kids to Charlottesville. 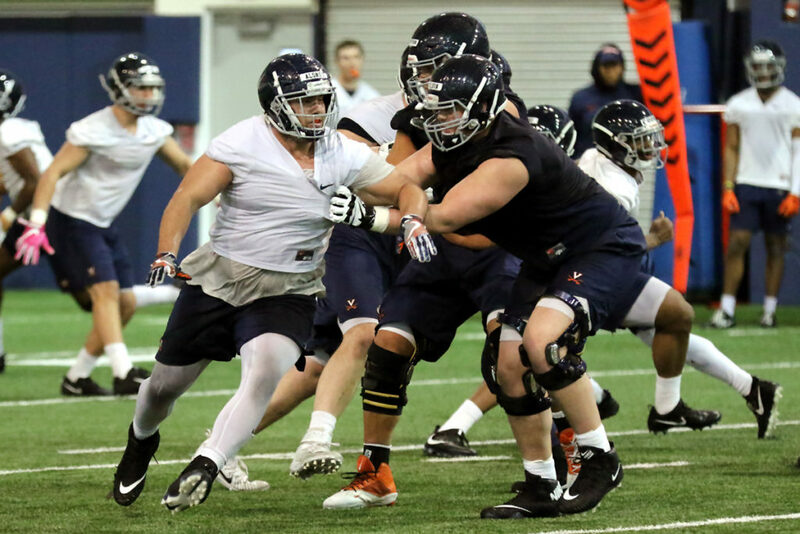 Mendenhall and company are putting in the effort in Virginia and surrounding states, but they wisely have cast a wide recruiting net throughout the country. Perhaps as a result, Florida has emerged as a state where Virginia not only has enjoyed recent recruiting success but is also planting the seeds for future recruiting efforts. From 2002 through 2016, 13 prospects from Florida signed with the Hoos. This number includes Deedrick Daniels (Mike London commit who re-committed to Mendenhall) and Trysten Hill (a Mendenhall late addition) in the class of 2016, though neither player ever enrolled on Grounds. Since then, Virginia signed seven Florida prospects combined in 2017 and 2018, and five more have committed in this recruiting cycle. Additionally, rising redshirt sophomore safety Brenton Nelson, a Miami (FL) native who attended DeMatha Catholic (Hyattsville, MD) for the final year of high school, as well as three rising redshirt freshmen walk-ons – quarterback Tristan Hillerich, fullback Andrew Yavinsky, and receiver Shane Eilers – are now on UVA’s roster. Aside from the panhandle, the Hoos have recruited well throughout Florida, landing prospects from Fort Lauderdale, Fort Myers, Jacksonville, Kissimmee (outside of Orlando), Lakeland, Miami, Naples, North Palm Beach, Sarasota, Tampa, West Palm Beach, Windermere, and Yulee. So far, we are seeing these Sunshine State products produce. Nelson was named ACC Defensive Rookie of the Year as a redshirt freshman last season. As true freshmen in 2017, Jamari Peacock played in 13 games and earned two starts as a blocking back while defensive end Mandy Alonso (pictured above in the white jersey) played in 11 games and earned four starts. How 6’10” offensive lineman Ryan Swoboda turns out remains to be seen, as he redshirted last fall during his freshman campaign. The second wave of Florida scholarship recruits arrives this summer. This group includes wide receivers Tavares Kelly (a potential immediate impact player on offense and special teams) and Wooby Theork, offensive lineman Martin Weisz, and defensive lineman Jordan Redmond. Committed in 2019 are Teter, outside linebacker D’Sean Perry, Dunbar (Fort Myers, FL) speedy H-back-type Seneca Milledge and his defensive back teammate Major Williams, and Jacksonville defensive back/wide receiver Antonio Clary. All five pledges boast multiple BCS-level offers. Ideally, Virginia will get to the point where more in-state recruits want to come on board. If that happens and UVA has talent-rich Florida on its list of dependable recruiting grounds, that’s a potential major positive for the future talent level of the Cavalier football team.